Bake Box 4 arrived last week and as usual I was very excited to find out what was inside! 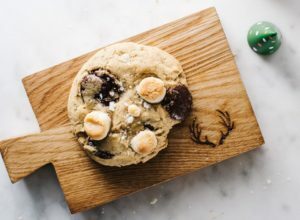 If you’ve not heard of Bake Box before it’s a bi-monthly subscription service for all the baking lovers out there. Once you sign up, every two months you receive a themed box filled with bakeware items, a specialist decorative item and 6 recipe cards to inspire you. Jump straight to the recipe! The item I liked the most was definitely the lattice roller. I’ve seen them on TV, but always thought it was a bit of a frivalous item to buy, so getting one as part of the box was perfect! The cookie cutters were also really cute and I loved their woodland design. The recipe cards were a gorgeous looking selection of picnic treats and stunning bakes. 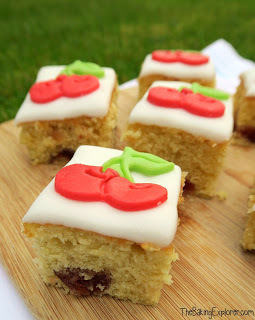 I decided to make the cherry traybake as I love cherries! It also looked like an easy recipe to pack up for a picnic whilst still looking really pretty. 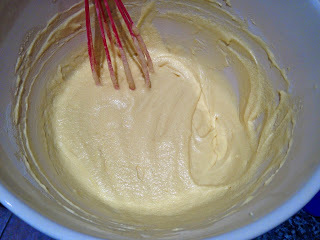 I started by making the sponge, I creamed together butter and golden caster sugar. Then I whisked in eggs and milk. Finally I folded in self raising flour, baking powder and ground almonds. I tossed glacé cherries in flour then added them to the mixture. 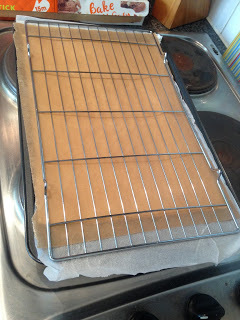 I poured the batter into a lined traybake tin and smoothed it out. It baked on 160C Fan/ 180C/350F/Gas Mark 4 for 30 minutes. 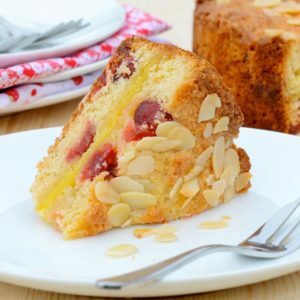 To make the cherries I decided to use marzipan as I had it in the cupboard already and I thought the almond flavour would go well with the cherry sponge. 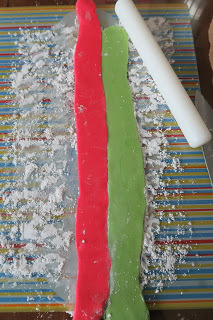 I split the marzipan in half and kneaded green and red food colouring into each half. 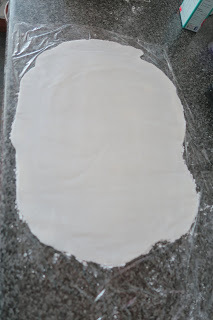 I then dusted my work surface with icing sugar and rolled them out into strips and connected them by rolling the edges together. 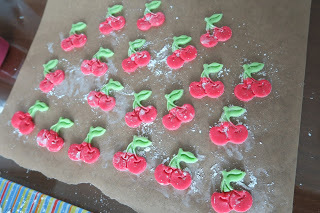 Then I used the cherry plunger from Bake Box to cut out the cherry decorations. I lay them on some baking paper to set. When the sponge was cool I brushed it all over with 2 tbsp jam. I used strawberry as I had some in the fridge, but of course cherry would be ideal. Then I rolled out the white ready to roll icing. 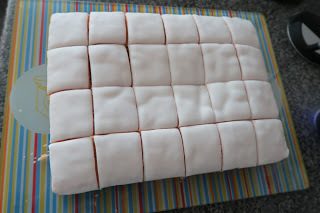 I covered the sponge with the white icing, trimmed the edges, then cut the traybake into squares – 4 by 6. 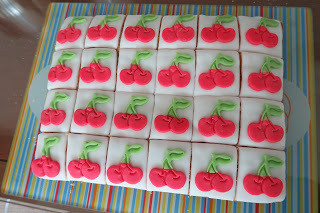 Finally I brushed water onto the back of the cherry decorations and stuck them down onto each square. 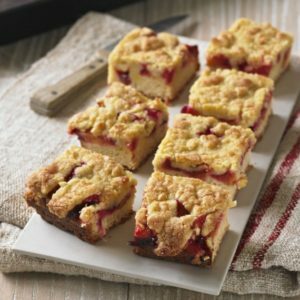 I thought the Cherry Traybake looked so pretty! The cherry design from the plunger looked so fun and colourful. The sponge was delicious too, it was really light and perfectly punctuated by the sweet cherries throughout. Disclaimer: I am sent the Bake Box free of charge, all opinions are my own. You can find more of my Traybake recipes by clicking here! I’m pretty sure that everyone can relate to the feeling of never having enough time to do the things you want to do. For me this relates to baking a lot. I wish I had more time to bake all the things I’d like to try! 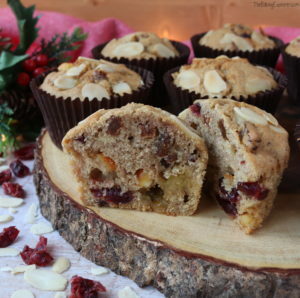 So sometimes a recipe like these Stollen Muffins is just what I need. Instead of making stollen, which needs 2 hours time to prove, I thought I’d make Stollen Muffins for a quicker result with just as much flavour! 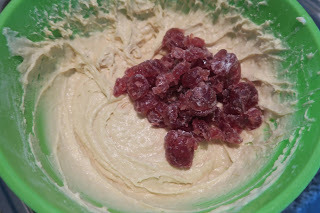 I prepared the dried fruit and marzipan first and tossed it in flour. To make the sponge I creamed together butter and caster sugar. 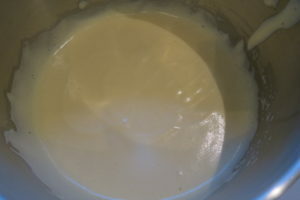 In a separate bowl I whisked up eggs, milk, brandy and almond extract, I added it to the mixture and whisked in. Then I added self raising flour, ground almonds, bicarbonate of soda, cinnamon, mixed spice and nutmeg. 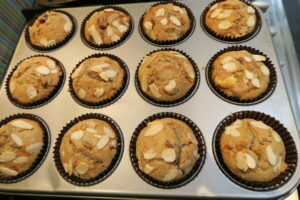 Then I folded in the fruit and marzipan, and divided the miture into paper cases and sprinkled some flaked almonds over each muffin. They baked for 25 minutes and came out lovely and golden brown, I left them to cool completely. 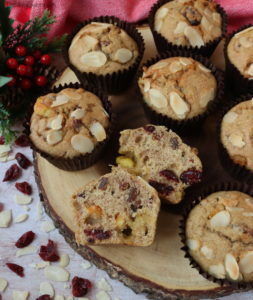 If you are a fan of stollen and also short of time like me, I highly recommend these Stollen Muffins. 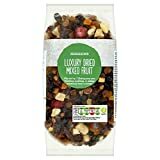 It’s got everything your taste buds are craving; Christmas spices, sweet fruit and nutty marzipan. They embody Christmas flavours and will be a guaranteed hit with all your family, friends or colleagues! 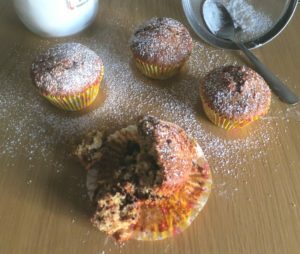 You can find more of my Muffin recipes by clicking here! 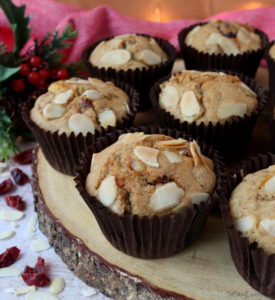 Or click here for more Christmas recipes! The final is finally here! And what a tense one it was… We started by looking back over the past 10 weeks – which have gone so fast!! 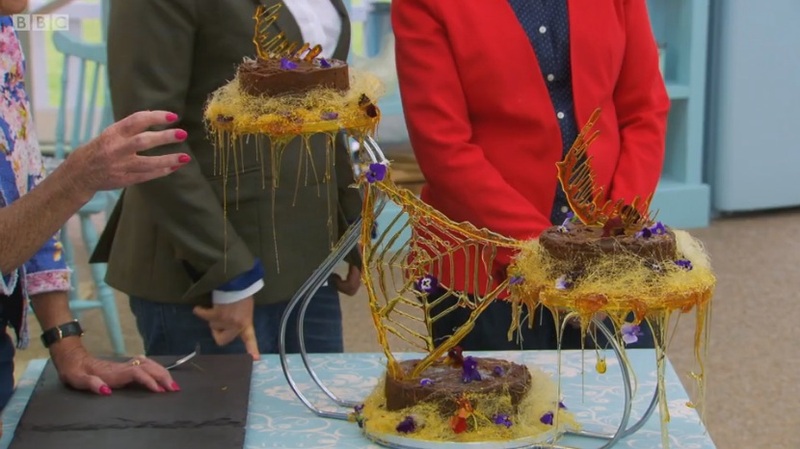 – and all the amazing bakes the three finalists have produced as well as their various ups and downs along the way. 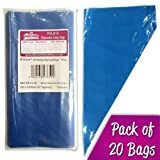 In total they have completed 27 baking challenges! 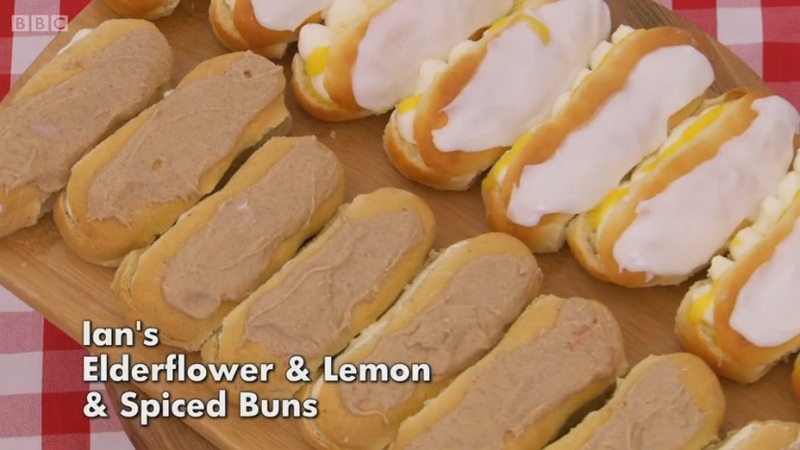 The bakers started with a signature challenge of iced buns. Mary and Paul requested 16 iced and filled buns, and they wanted two different flavours. Paul was looking for everything to be the best the bakers could make. 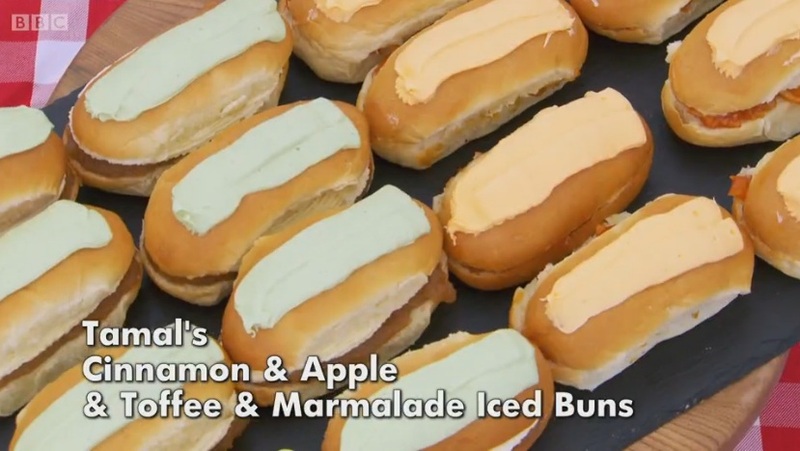 Mary had no idea who was going to win, but she knew she wanted to see perfect iced buns that tasted delicious! Tamal made citrus marmalade & caramel creme pat and apple & whipped cream buns. He did royal icing for the tops and didn’t flavour his icing or his dough, which raised eyebrows from the judges. His caramel creme pat did not set, so it didn’t make it into his buns. Paul brought up Tamal’s issues with timing and Mary pointed out that his icing wasn’t great. They enjoyed the texture of his buns and absolutely loved his citrus marmalade. 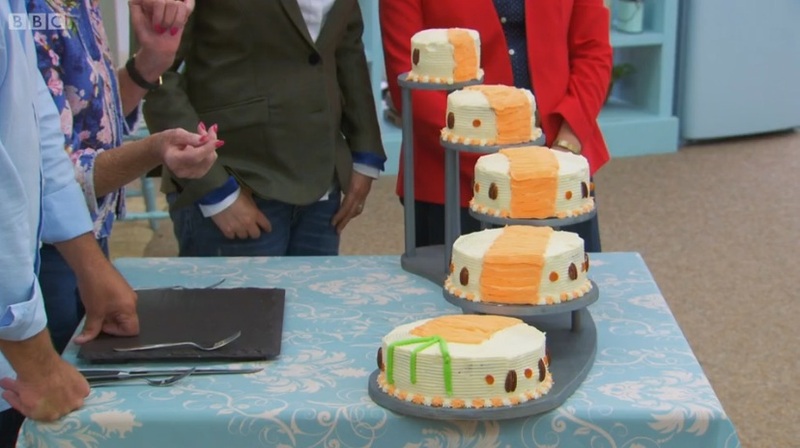 A real friendship has blossomed between Tamal and Nadiya which was nice to see as I’ve not noticed as many close bonds from the bakers this series. Nadiya made cardamom buns with almond creme pat and nutmeg buns with a sour cherry filling. There was some contention over whether the buns should touch or not and be a ‘batch bake’. Tamal and Ian’s touched, but Nadiya’s didn’t. Nadiya also made round buns. Although she strayed from tradition, Mary loved her neat icing and original approach. Paul also ended up being a huge fan after tasting them! 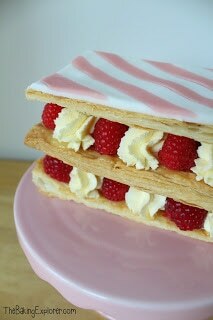 The final technical challenge was to make Raspberry Mille Feuille. This is three layers of crispy ruff puff pastry filled with raspberries, jam and chantilly cream, and topped with fondant icing. 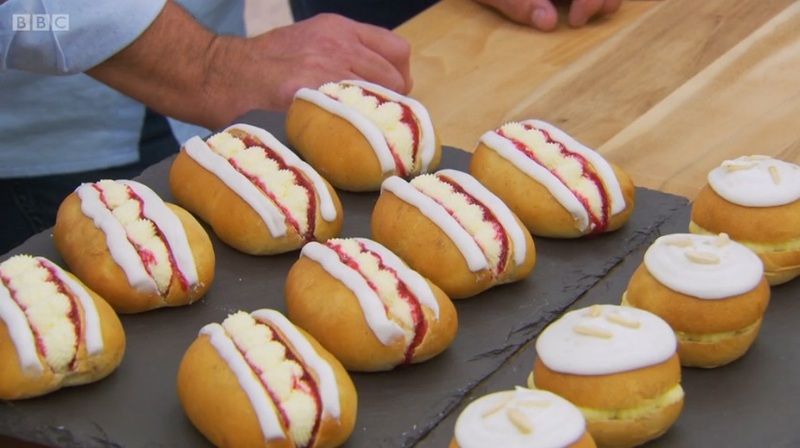 Paul and Mary chose this challenge to test the bakers as they have all had issues with pastry challenges in the past – and Nadiya figured out that it was personally designed for them! 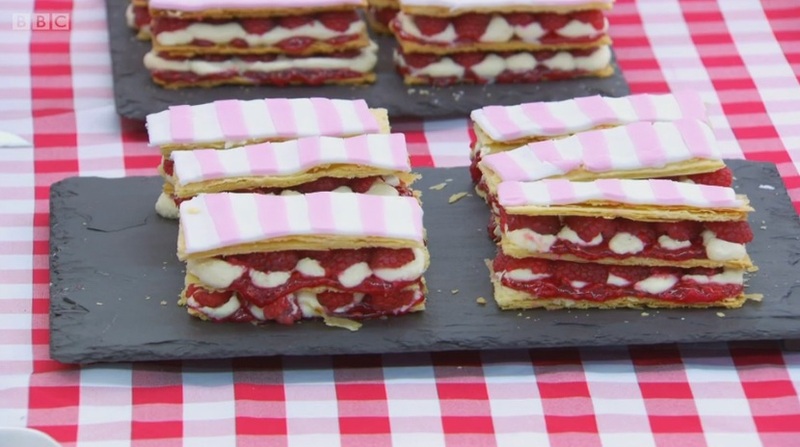 Of course a lot of instructions were left out of the Raspberry Mille Feuille recipe. The bakers had to make a sugar syrup, but had no idea what part of the recipe it was for. 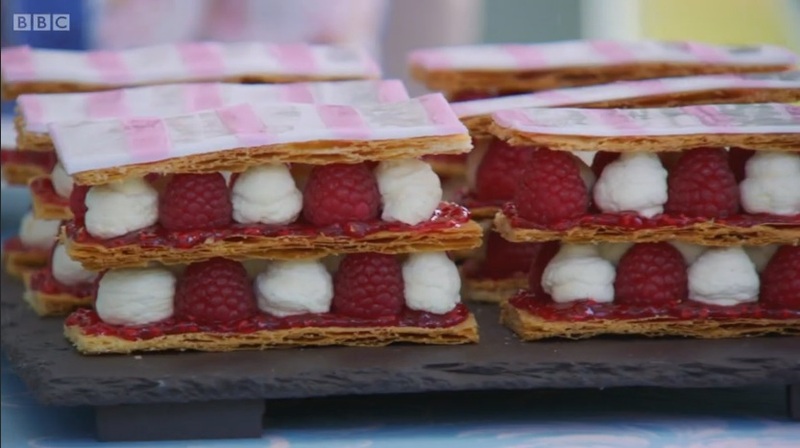 Tamal had problems with his pastry, and Nadiya couldn’t figure out how to arrange the Raspberry Mille Feuille. Tamal came last as his pastry wasn’t quite right, Ian was second as his pastry wasn’t quite cooked. And Nadiya came first! Her pastry was excellent and her presentation was very neat. For the final showstopper the bakerswere asked to make a single flavoured, but multi tiered, classic British cake. The judges wanted perfect flavours, consistency throughout the tiers and a stunning appearance to make them say ‘wow!’ Tamal made a sticky toffe pudding fruit cake, which was topped with a date and toffee sauce and he decorated it beautifully with spun sugar. He was concerned about the humidty affecting his caramel as it was raining at the start of the challenge, thankfully the rain stopped. Mary thought it looked spectacular and breathtaking. They were impressed with his spun sugar technique, thought his cake was totally different and very delicious. 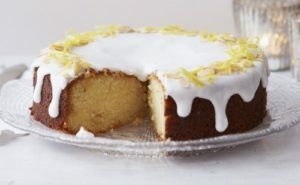 Nadiya chose to make a lemon drizzle cake. She explained that she did not have a cake at her wedding, so this was going to be her wedding cake. She filled them with lemon curd and lemon buttercream, and she made her own fondant out of marshmallow. The judges thought it looked elegant and beautiful, that it was evenly baked and had a consistent texture throughout. Overall they called it ‘stunning’. Ian decided to make five tiers of carrot cake with cream cheese frosting. He also made his own stand to display his cakes on. The judges thought it had a very contemporary apperance, and the texture of all five cakes was very consistent. Paul called it one of the best carrot cakes he’d ever had! 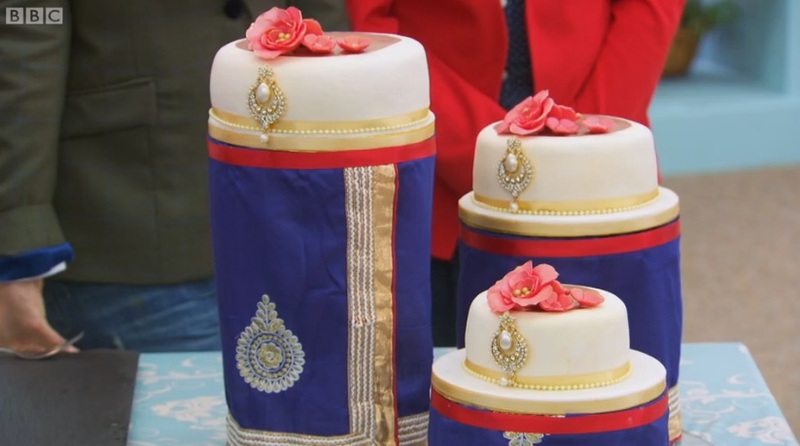 What a close showstopper this was, every baker got excellent feedback from the judges. I don’t think this has ever happened before! 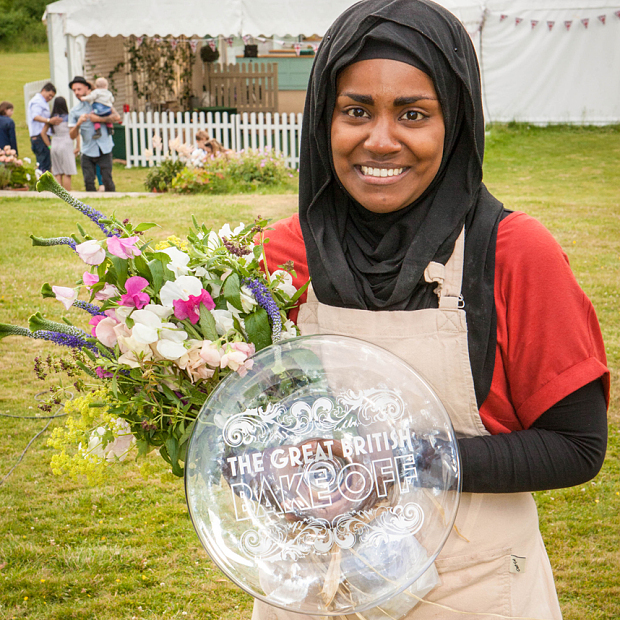 And the winner is… Nadiya! She certainly deserved it as she did the best in the first two challenges, and the showstopper was such a close one. Suffice to say, she was in complete shock! Paul talked about her passion for baking and her flair for flavours. Mary was so proud of Nadiya and her journey, and even got a bit emotional in front of camera – I don’t think that has ever happened before either! I don’t know about you but I can’t wait to see what Nadiya, Tamal, Ian and all the other bakers this year do next. So The Great British Bake Off is over for another year, it always flies by so fast. 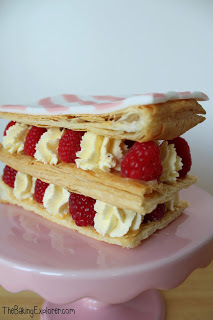 I decided to make the Raspberry Mille Feuille, which was the technical challenge from the final episode for a couple of reasons. One of them being my boyfriend requested it, and the second being that I thought it looked really delicious and pretty. 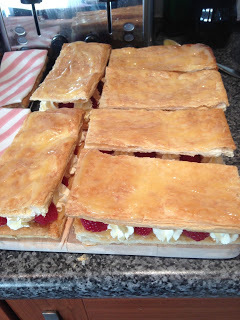 I followed the same Paul Hollywood recipe that the bakers used to make the Raspberry Mille Feuille. 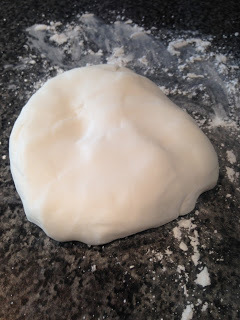 I started by kneading white fondant until it was soft and pliable, to stop it from sticking I used icing sugar to dust the work surface. 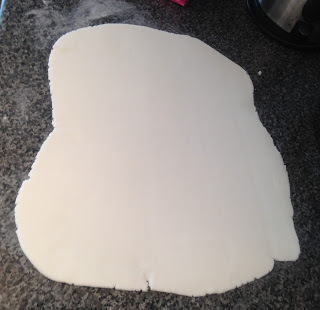 Then I rolled out the fondant making sure it was big enough to cut out a square measuring 12″ x 9″. 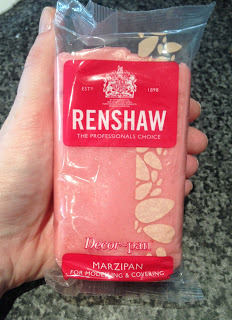 I decided to use Renshaw Decor-pan, which is coloured marzipan, as it was the perfect pink shade for the recipe. You can also use pink fondant of course. I rolled out the marzipan, again using icing sugar to stop it from sticking to the surface, then I used a knife to cut 1cm wide stripes. 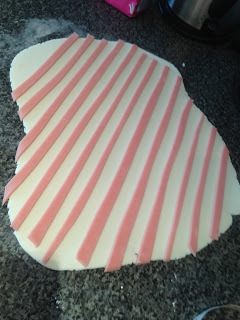 I laid the stripes of marzipan out onto the white fondant. 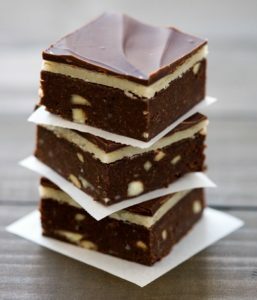 The recipe photo had the stripes straight, but I liked Ian’s diagonal ones on the show so I did the same. 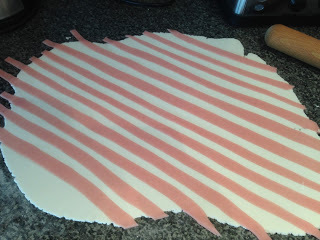 I then rolled over the stripes to infuse them with the fondant. 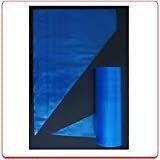 I cut out 6 squares, measuring 6″ x 3″. It doesn’t matter if they are a little larger as you can trim them. 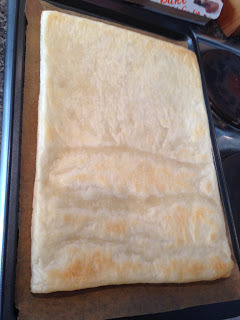 For the pastry I used 3 sheets of Jus Roll Puff Pastry. I rolled it out onto a baking tray. 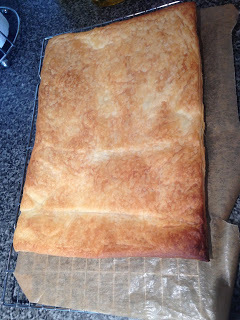 I covered the pastry with another piece of baking paper, then a cooling rack over the top. 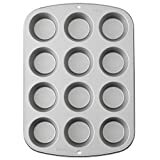 This keeps the pastry from rising too much and keeps it even, you could also use another baking tray laid on top. I baked the pastry on 200C/400F/Gas Mark 6 for 15 minutes. I flipped it upside down and baked it again, this time without the cooling rack on top, for 10 minutes. 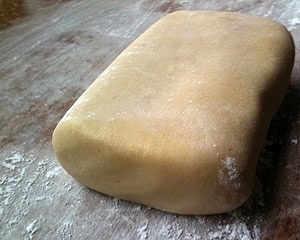 Once the pastry was cool enough to handle, then cut it into 6 pieces measuring 6″ x 3″. 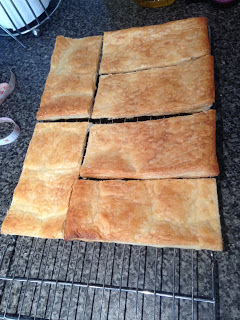 I did this again twice more with the other two sheets of pastry until I had 18 pieces of pastry in total. 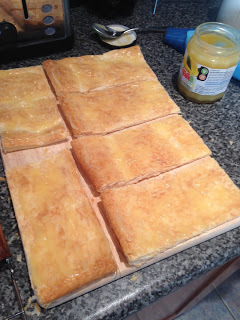 I coated 12 pieces of the pastry with lemon curd. The recipe said to use raspberry jam, but I didn’t have any and I preferred using lemon curd instead. 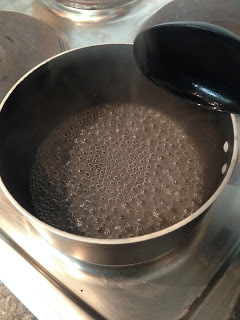 I made a sugar syrup using caster sugar and water. I brought it to the boil in a pan and let it bubble for 1 minute. Then I took it off the heat and let it cool down. 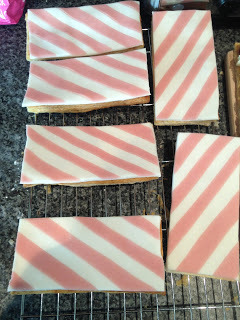 I brushed the syrup onto the other six pieces of pastry and stuck the squares of stripy icing over them. 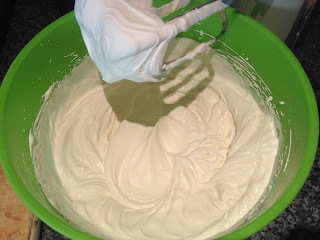 To make the chantilly cream I whipped up double cream, icing sugar and vanilla extract. I piped the cream onto the lemon curd covered pastry and alternated it with fresh raspberries. 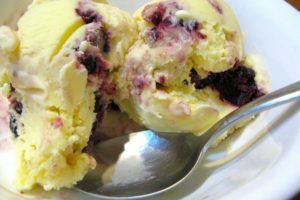 These things used so many more raspberries than the recipe stated – I used 5 punnets! I put the next layer on, did the same again with the cream and raspberries, and finally topped them with the stripy pastry. 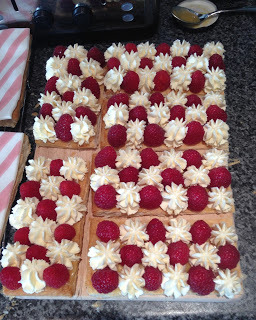 The Raspberry Mille Feuille looked so pretty! I absolutely loved the appearance of them with the stripy icing on top. They were absolutely massive though, one can easily be shared between two. Or they could also be made half the size. The Raspberry Mille Feuille were fairly tricky to eat too, but so delicious and worth all the pastry on your jumper and cream on your face! 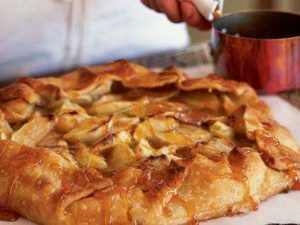 You can find more of my Pastry recipes by clicking here! I’ve mentioned before that I attend my local Women’s Institute (WI) on a monthly basis. Well last month’s meeting was a bit different in that we had an outing to visit some nearby bees. I had no idea that there are beehives on the roofs of many of the city’s buildings. 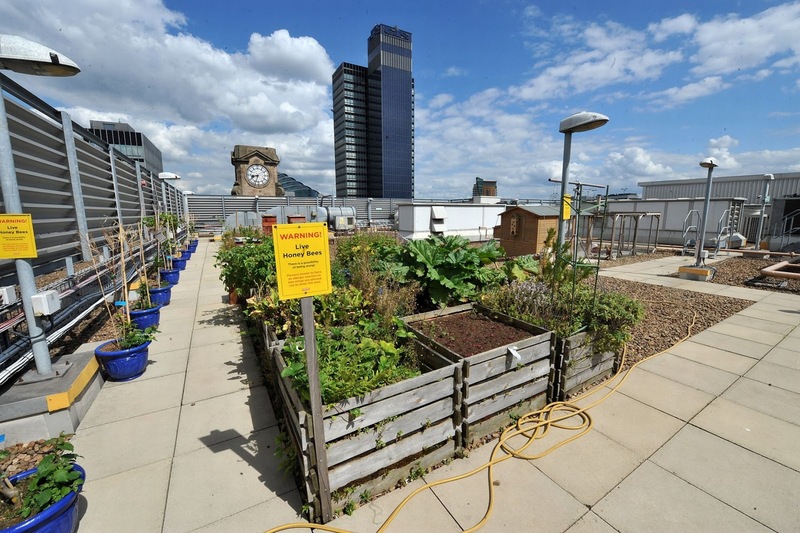 After a talk from a local beekeeper we headed up to the roof of The Printworks where they have chickens, a vegetable garden and two beehives. It was dark when we visited, but I found the below photo online which gives a much clearer view! The bees are looked after by someone from the Hard Rock Cafe, vegetables from the garden are used to make soup for the homeless, and the wild flower section of the garden was dontaed by Bez from the Happy Mondays. Who knew all this was going on right above our heads! Bees are such fascinating creatures and so essential to our environment. 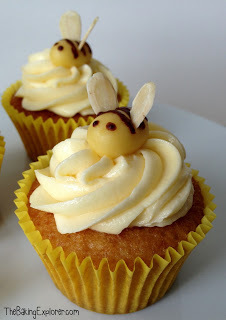 So in honour of our bee themed meeting I decided to make some Honey & Orange Cupcakes with cute little bees on top! 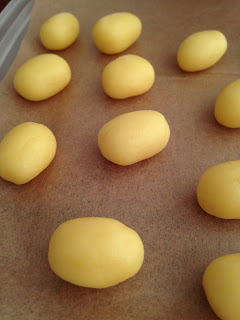 To make the bees I started by rolling chunks of golden marzipan to make the bees bodies. I laid them onto baking paper. 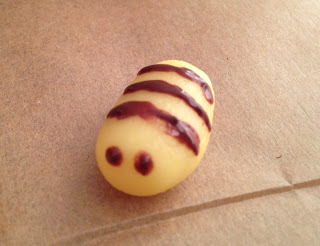 I melted a few blocks of dark chocolate in the microwave and painted the bees stripes and eyes onto the marzipan bodies using a brand new paint brush. You could probably also do this with a cocktail stick. I pushed flaked almonds into the bees to make the wings. 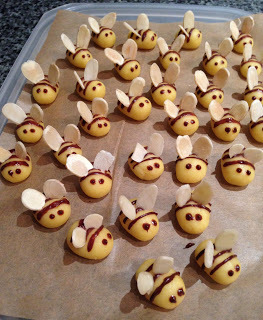 Soon I had a swarm of marzipan bees! I made 30+ cupcakes for my WI meeting, but I’ll give you the recipe for 12 cupcakes, then you can double and triple it as you need. 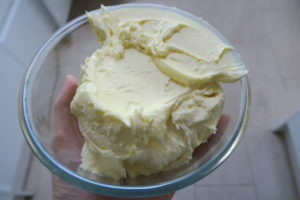 To make the cupcakes I started by creaming butter, honey and caster sugar together. I added eggs, the zest of one orange, orange juice and orange extract. Finally I mixed in self raising flour. 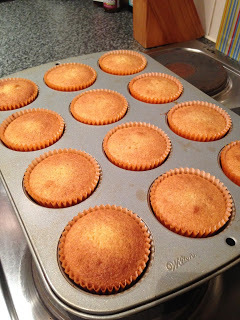 I baked the cupcakes on 180C/350F/Gas Mark 4 for 15 minutes until golden brown. I got a new oven recently and it bakes things super fast so you may need to leave them in for 20 minutes depending on your oven. 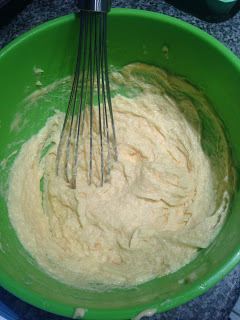 Next I made some buttercream by mixing butter, honey, icing sugar and orange extract. I piped it onto the cupcakes when they were fully cool. 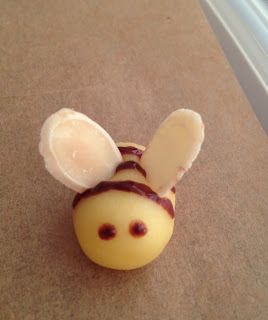 Finally I added the super cute marzipan bees! I loved the final effect, the little ‘bees’ looked so adorable. I got some really lovely comments when I presented the Honey & Orange Cupcakes at the meeting and was pleased to see them all fly off the table! 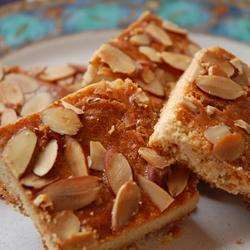 Sponge recipe adapted from Rowse Honey. You can find more of my Cupcake recipes by clicking here! 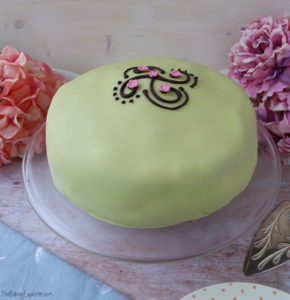 In Sweden, the one baked good they are crazy about (besides cinnamon buns) is Swedish Princess Cake, also known as Prinsesstårta. I recently spent a week in Stockholm, Sweden and saw these gorgeous green cakes everywhere. 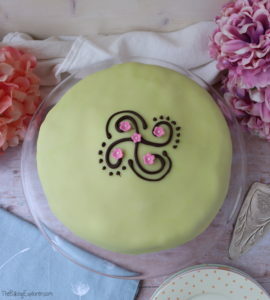 I’ve made a full size Swedish Princess Cake after the Great British Bake Off featured them as a technical challenge, but I thought turning it into Swedish Princess Cupcakes would be really cute and fun! Plus it’s a simpler way to get the delightful taste of the Prinsesstårta without making a full sized one. the seeds from a vanilla pod until it reached boiling point. Then I took it off the heat and poured into a jug. 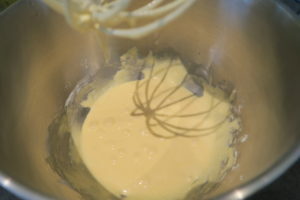 In my food mixer I whisked up egg yolks with caster sugar until pale and thick. 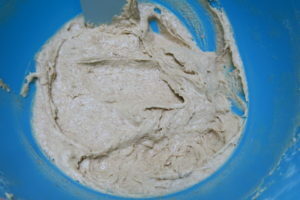 I added cornflour and mixed that in. 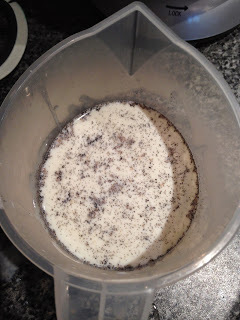 Then I put the mixer on a medium speed and poured the milk in slowly as it mixed. 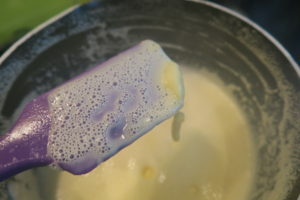 I poured the mixture back into the pan and heated it up whilst stirring continuously. 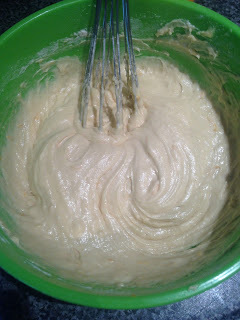 There is a moment when it suddenly thickens, I started whisking it at this point to keep it smooth and stop any lumps. I put it in a bowl, and covered it with cling film. I made sure the cling film was touching the creme patisserie so that a skin doesn’t form on it. Then I left it in the fridge overnight to cool. The next day I made the cupcakes. I was taking them to a dinner party where one of the guests had a gluten intolerance so I made regular cupcakes with gluten free flour. So it’s up to you which to use if you try this recipe. I creamed together butter and caster sugar. I then whisked in eggs and vanilla extract. 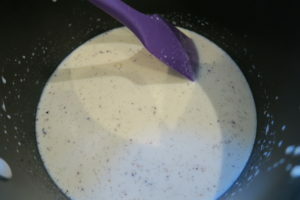 Next I added gluten free self raising flour and milk, and mixed in. 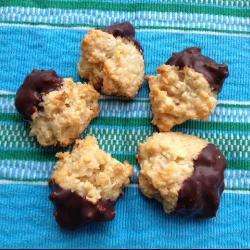 If you don’t need these to be gluten free, just use regular self raising flour and don’t add the milk. I divided the cupcake mixture into 7 cases as that’s how many I needed, but I reckon you could stretch the mixture to 8 cupcakes. As I mentioned before, as the creme patisserie recipe makes quite a lot so you can make a lot more cupcakes to use it up if you wish. They baked for 20 minutes until golden. I left them to cool completely. 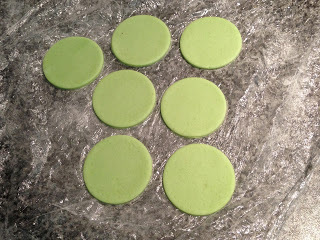 While they were cooling I kneaded some green food colouring into natural marzipan and cut out 2.5 inch circles. I got exactly 19 circles from this much marzipan. Then I left the marzipan out to harden up. 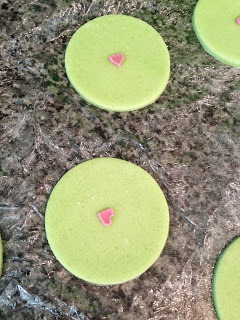 I used a tiny dab of water to stick a pink heart sprinkle into the middle of each marzipan circle. Traditionally a pink flower is put on top of a Prinsesstårta, but I had these pink heart sprinkles in the cupboard from Valentine’s Day baking and I thought they looked really cute! Once fully cool I used a knife to scoop out the middle of the cupcakes. 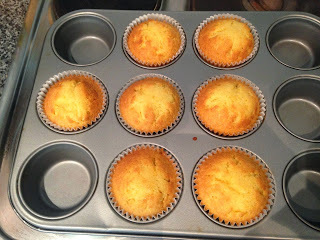 A cupcake corer won’t make enough room for the filling so you do need to do this manually. 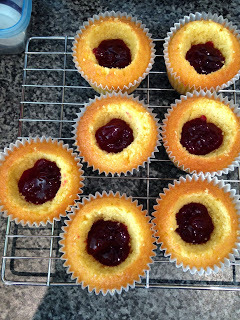 I half filled the holes with seedless raspberry jam, about 1 tsp per cupcakes. Then I topped them up with the creme patisserie and smoothed the top. I whipped up double cream and piped swirls onto each cupcake, I kept the swirls flat so I could place a circle of marzipan on top. 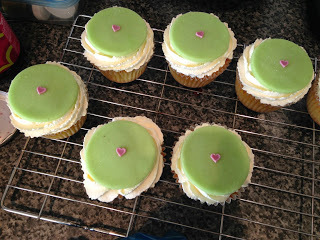 Well I was so pleased with the Swedish Princess Cupcakes! 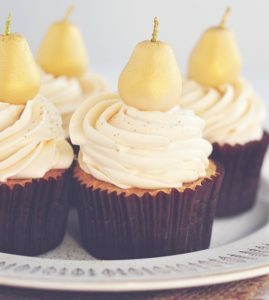 I found making a full sized Prinsesstårta really tough in terms or decorating as I’m not skilled with covering cakes in fondant/marzipan, but these Swedish Princess Cupcakes are so much simpler. Everyone at the dinner party loved the cupcakes. 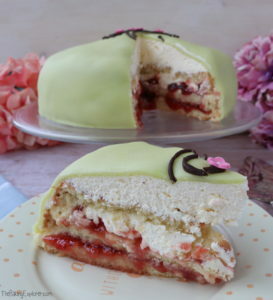 The Swedes really have it down, I mean, cream, custard and jam in a cake – how can you go wrong?! 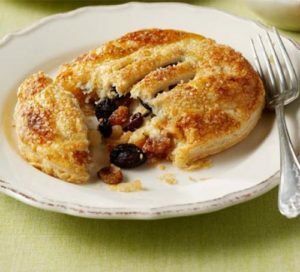 Simnel Cakes go way back, all the way to medival times in fact. 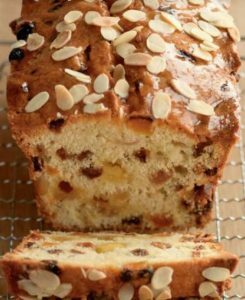 I’ve never actually eaten a traditional one before, which just have one layer of fruit cake, but I see them in the shops every Easter. The marzipan balls on top represent the twele apostles, minus Judas. Although I’m not religious myself, I love Easter and baking around this time of year. I wanted to make the Simnel cake a bit more modern and also more to my own tastes, so this Golden Layered Simnel Cake is filled with delicious almond buttercream and the sponge is much lighter with less fruit. 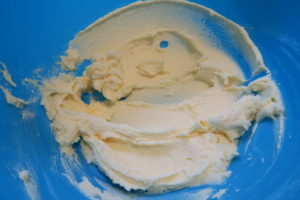 I started by creaming together butter and golden caster sugar. 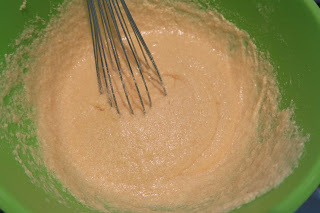 Then I whisked in eggs, adding two at a time and mixing well. I folded in mixed spice, salt and self raising flour. 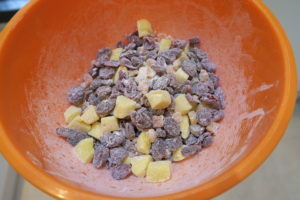 Then I gently mixed in lemon zest and dried fruit. I divided the mixture between 3 lined cake tins. They baked for 25 minutes until golden brown. 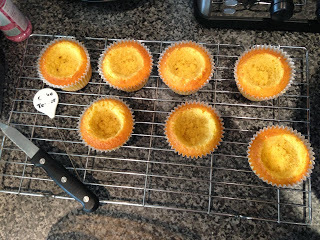 I tipped the sponges out of the tins and left to cool. 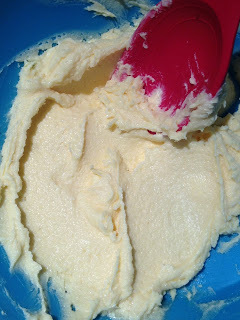 When the sponges were fully cool I made some buttercream by mixing icing sugar, butter and almond extract together. I piped it around the edge of the first layer and smeared it in the middle. I placed the second layer on top and did the same with the remaining buttercream. 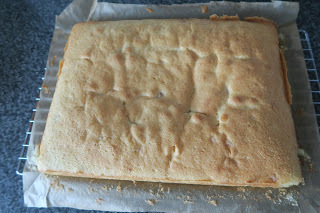 Then I added the final sponge layer and brushed some apricot jam over the top to help the marzipan stick. I used natural marzipan for the decoration. Each ball was 15g each and the rest I rolled out into a disc. I placed it on top of the cake and trimmed the edges. Then I brushed it all over with egg white, placed the balls around the cake and brushed them with egg white too. I then used my handy cook’s blowtorch to scorch the marzipan in the centre and on top of each ball. If you don’t have a blowtorch you can put the cake under the grill to achieve this effect, however I would recommend decorating the top sponge on it’s own and grilling it before placing it over the buttercream, which will melt under a grill! I loved the final effect of the Golden Layered Simnel Cake, a gorgeous golden delight! My boyfriend’s eyes lit up with excitement when he saw it as he loves marzipan. He quickly ate up the first slice and was full of compliments for the flavour. The sponge of the Golden Layered Simnel Cake was lovely and light with just enough fruit for me and the sweet almond buttercream was the perfect accompaniment. It was a large cake and was cut into about 18 slices – plenty for a hungry group of family and friends at Easter! 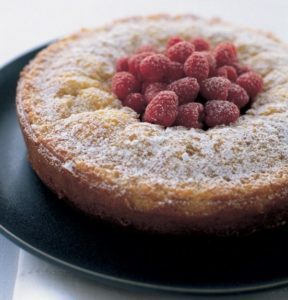 You can find more of my Cake recipes by clicking here! 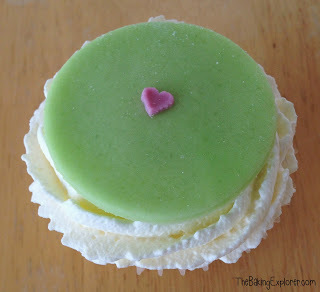 If you’ve not heard of a Swedish Princess Cake before then you are in for a treat! It’s made up of layers of light genoise sponge, filled with creme pattiserie, jam and whipped cream. Then it’s covered with green coloured marzipan and decorated with dark chocolate and sugar flowers. 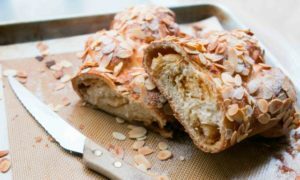 You may remember it being a technical challenge on The Great British Bake Off, and it is quite a complex bake with several different stages. I spread it out over a couple of days by making the creme pattiserie and the genoise sponge the day before, then I assemble and decorate it before serving the next day. If you are up for the challenge I can promise you it’s worth it, as it’s absolutely yummy!! I started by making the creme patisserie as it needs time to cool down. In a pan on a low heat I warmed the milk with the seeds from a vanilla pod until it started steaming. 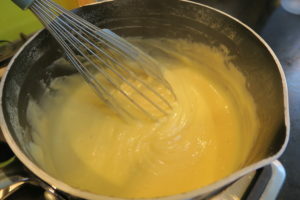 In my food mixer I whisked up the egg yolks and caster sugar until they were pale and thick. 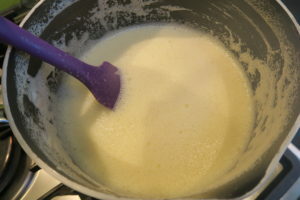 I added cornflour to the egg mixture and let it combine, then turned the mixer back on and poured the warm milk in slowly. 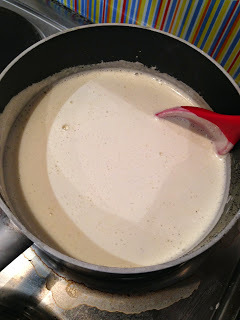 Then I poured the egg and milk mixture back into the pan and heated it up whilst continuously stirring. 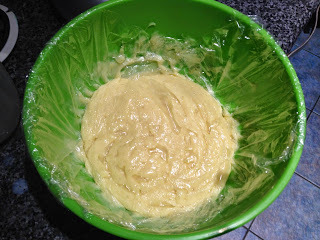 There is a moment when it suddenly starts to thicken and at that point I started whisking to keep it smooth and stop any lumps. 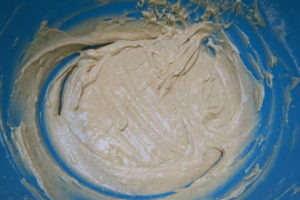 Once the whole mixture was thick and smooth I took it off the heat and put it in a bowl. I covered it with cling film making sure the cling film was touching the top of the creme pattiserie. Then I left it in the fridge overnight to cool. Next up was the genoise sponge. 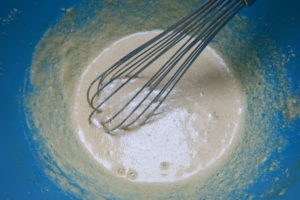 In my food mixer I whisked up eggs with caster sugar until pale and super thick. 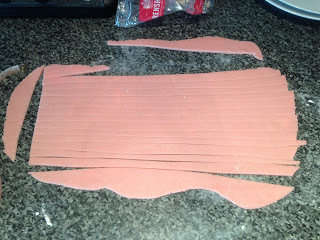 When you lift the whisk out the mixture that falls off should stay on the surface for 3 seconds before sinking in – this is called the ribbon stage. 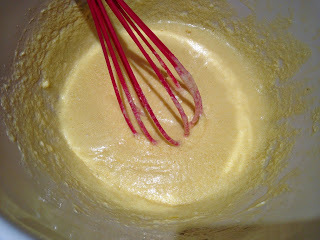 I folded plain flour and sugar into the egg mixture very gently so as little air was lost as possible. I then put it in the tin and baked the sponge for 25 minutes. Once it was fully cool I carefully cut the sponge into three and put the first piece on my cake stand. 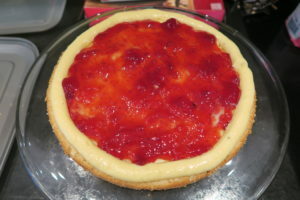 I spread a thin layer of the creme patisserie onto it, then piped a border of it around the edge and filled the middle with jam. I put the second sponge on and spread over more creme patisserie and did another border around the edge. Traditionally, there is only meant to be one layer of jam, but I love jam so I added it to both layers! This time the jam got some whipped cream on top of it too. 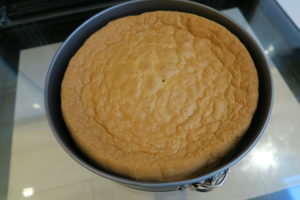 I placed the final sponge layer on, then spread double cream over the whole cake, making a dome shape on top. 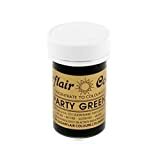 Then I kneaded green food colouring into natural marzipan and rolled it out, then covered the whole cake with it as neatly as I could and trimmed the edges. 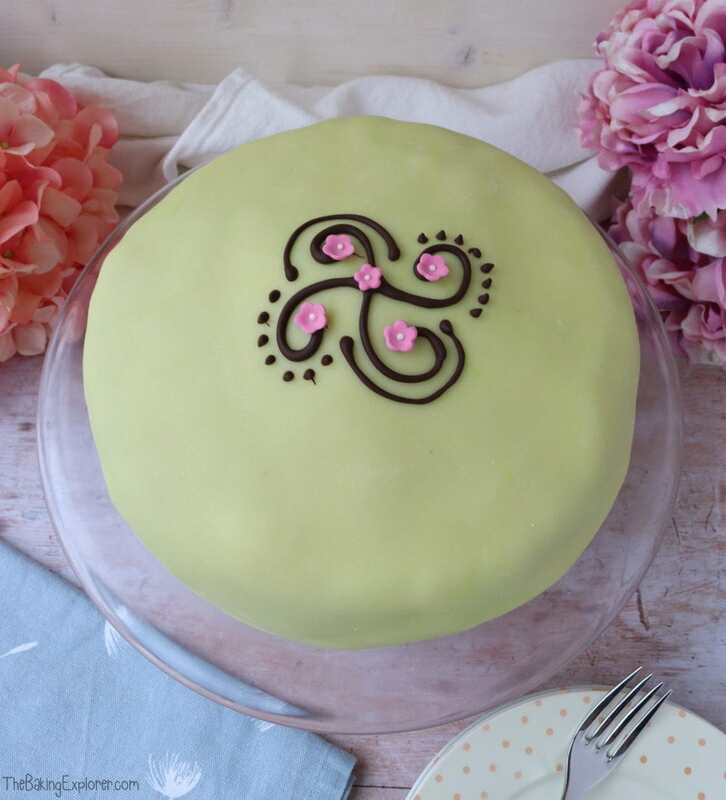 To finish the Swedish Princess Cake, I melted some dark chocolate and piped a design on top, and added some pink sugar flowers. 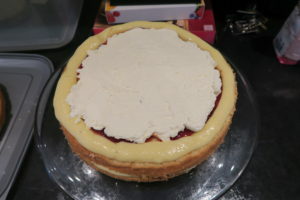 When the Swedish Princess Cake was cut the layers were not very well defined – I may have gone overboard with the jam! It’s a very indulgent cake and there is obviously a ton of cream, so I think the jam is a nice fruity way to offset the sweetness. And even if you are not a huge fan of marzipan, it’s not overpowering. 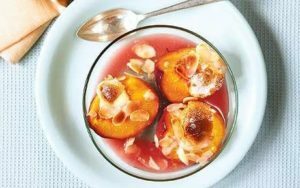 Recipe adapted from The Telegraph. You can find more of my Dessert recipes by clicking here! 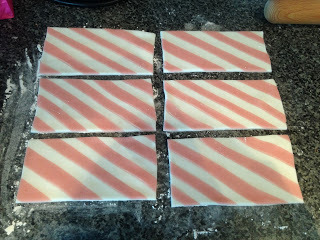 After my recent Six Things To Do With… Marzipan post, I decided I really wanted to try and make a Battenberg cake. It has been used as a technical challenge on The Great British Bake Off so I thought it would be a good challenge for me as a baker. I haven’t done anything overly challenging or technical in a while, plus I had plenty of marzipan lying around. I am not sure whether the correct spelling is ‘Battenberg’ or ‘Battenburg’ as I have seen both, but the recipe I chose to follow is by the Hairy Bikers so I went with their spelling! First, you need a square baking pan. I picked one up in Tesco. 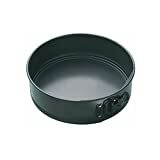 The recipe says to use a 20cm tin, mine was 21cm and this didn’t cause any problems. 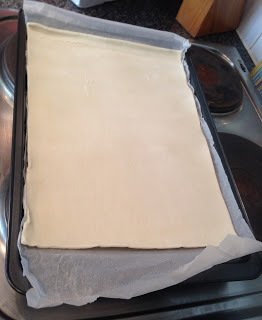 I measured out a piece of baking paper that was 30cm x 20cm. I folded it in half, and folded it back leaving a 4cm tall fold. It’s hard to describe so hopefully the above photo makes it clear. 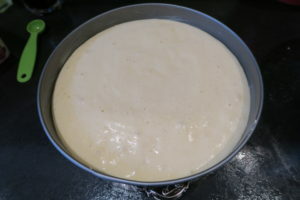 The fold should stick up in the middle so the two parts of the sponge don’t mix when cooking. 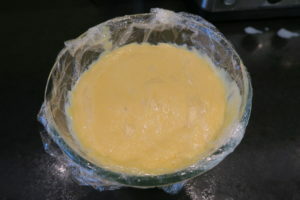 To make the sponge I mixed together 175g butter, 175g Whitworths Fine Demerara Sugar (I didn’t have any golden caster sugar and had some of this in the cupboard), 3 eggs, 1/2 tsp vanilla extract and 175g self raising flour. Using scales I split the mixture into seperate bowls until the weights matched exactly. I added Sugarflair Christmas Red food colouring to one bowl until it went pink, you only need a little bit. 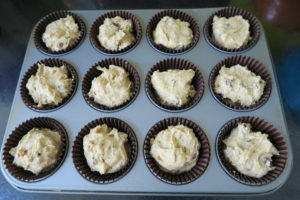 I poured the batter into the seperate sections of the tin. I actually ended up making this twice. The first time I baked on 180C for about 30-35 minutes. It hadn’t cooked properly and it was too late to put it back in the oven as it sunk quite badly. So in the bin it went and I started again. This time I cooked on 160C for the first 30 minutes, then turned it up to 180C for the final 25 minutes. It cooked much better the second time. I would say keep an eye on it and test it with a skewer or cake tester to make sure the part where the cakes meet in the middle is cooked as that’s the area where I had problems. 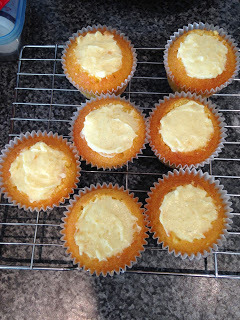 Once the cakes had fully cooled I trimmed the edges and then cut the cakes in half. It’s best to hold the cakes together whilst trimming so they stay an equal size. I rolled out some marzipan, and warmed and sieved 6 tbsp apricot jam. 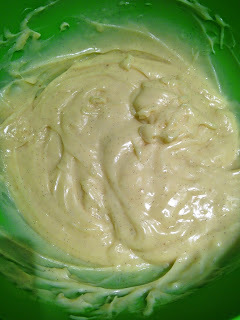 I also made an almond buttercream using 100g icing sugar, 50g butter and 3/4 tsp almond extract. 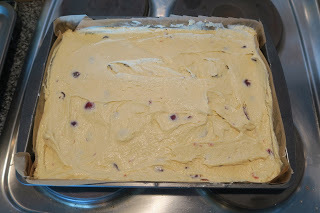 The recipe says to use the jam for both sticking the marzipan to the sponge, and to stick the sponge together. But I decided to do a buttercream to stick the sponge together instead because of the yummyness. The other two pieces of sponge went on with buttercream in the middle. I brushed the jam on the top and on the marzipan at the sides. Wrapping it around was the hardest part. There were some cracks in the marzipan and it was hard to get it wrapped tightly. I also decided to add some marzipan leaves to the top. I cut these out of the leftover marzipan using a knife and stuck them on using the leftover jam. 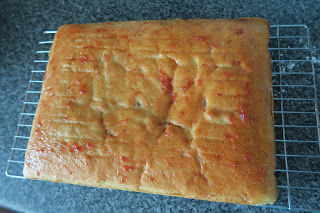 This was partly because the top looked a bit boring and partly to hide some imperfections in the marzipan! It looked better when I cut the end off. This also gave me an opportunity to taste it, delicious! The buttercream was definitely a good idea. I don’t think my Battenberg is technically perfect, but I am thrilled with how it turned out! Especially how neat my squares look. It tasted really good too, I was glad I used the almond buttercream. It does feel really good to conquer a baking challenge like this. I can understand to an exent what The Great British Bake Off contestants went through now! I took this into work and once it was sliced, it didn’t last long! 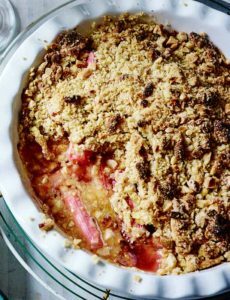 Have you made anything technical from The Great British Bake Off? Let me know in the comments if you make any of these recipes and how they turn out! 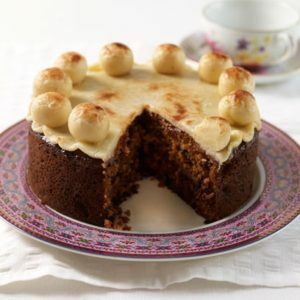 Marzipan is one of those love it or hate it foods, but if you’re a lover then you’ll be a fan of Simnel Cake which is traditionally served around Easter time. 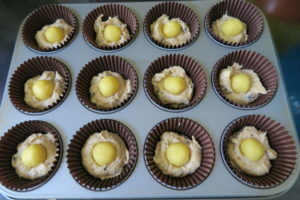 I’ve turned this famous Easter cake into these Easter Simnel Cupcakes. They’re packed with dried fruit, flavoured with spice and I’ve hidden a ball of marzipan inside each cupcake! For extra luxury I’ve swirled an almond buttercream on top and another marzipan ball. They are marzipan heaven and perfect for celebrating Easter! 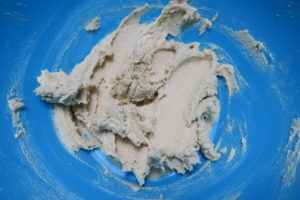 First I mixed together butter and light soft brown sugar until creamy. 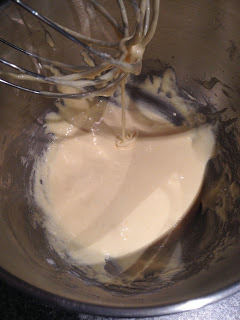 Then I added eggs, vanilla extract, milk and lemon extract, and mixed well. 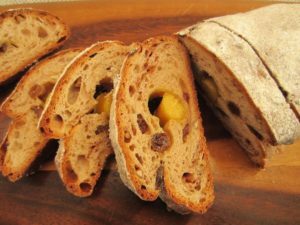 Finally I folded in self raising flour flour, self raising wholemeal flour, mixed spice and then the dried mixed fruit. 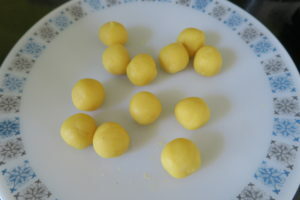 I used golden marzipan and made 12 balls each weighing 12g. 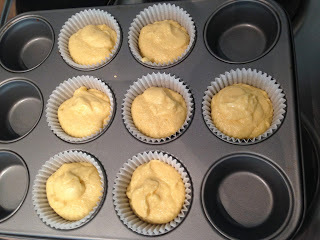 Once I had filled the cupcake cases with half of the mixture, I pushed the balls of marzipan in. 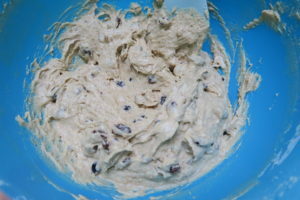 Then I put the rest of the mixture over the top. I baked them for about 20-25 minutes, until they were golden brown. 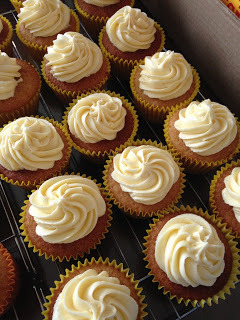 Once the cakes were cooled I whipped up some almond buttercream using icing sugar, butter and almond extract. 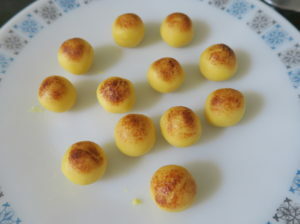 I made 12 more balls of marzipan and browned them with a kitchen blow torch. 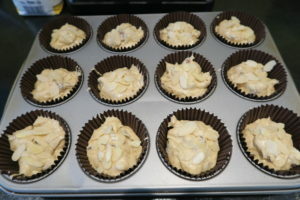 To decorate I piped the almond buttercream onto the Easter Simnel Cupcakes and added a browned marzipan ball on top. The cupcake sponge was really delicious, and had just the right amount of fruit. The marzipan ball hidden in the middle is such a nice surprise, your marzipan loving friends and family will love these Easter Simnel Cupcakes! 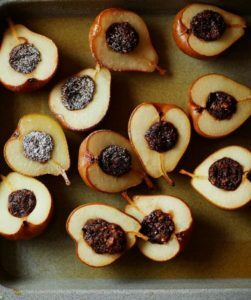 To decorate, divide the marzipan in 12g pieces and roll into balls using the palms of your hands, then brown the tops with a kitchen blowtorch. Or you can place them on a foil covered tray and pop them under the grill - but keep a close eye on them!